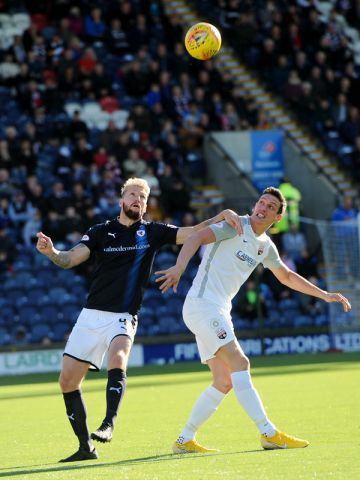 Raith Rovers maintained their unbeaten start to this season’s League One campaign with a 1-1 draw against Montrose at Stark’s Park this afternoon. In a somewhat dour affair, interim boss Kevin Cuthbert’s men didn’t perform well enough to warrant three points against a well-drilled, determined Montrose outfit who belied their pre-match position at the foot of the table. The sides, meeting on league business for the first time in 25 years, emerged into a sun-kissed arena, though it must be said that, as far as the Rovers faithful were concerned, the opening exchanges were decidedly gloomy as the Gable Endies took the game to their hosts. Rovers, with Nat Wedderburn patrolling the left-back area, and Lewis Milne and Ross Matthews supporting Grant Gillespie in the middle of the pitch, tried to get the ball forward to Kevin Nisbet and Lewis Vaughan, but the strikers were virtual spectators as the home side were pinned back, toiling to get out of their own half, far less introduce any coherence to their play. Montrose in fact forced their first corner kick of the match within sixty seconds, and this set the pattern for the first quarter of an hour. The busiest person initially from a Rovers perspective was the physio, who was called upon to provide medical attention to goalkeeper Kieran Wright, who came off worse in a heavy collision within his area, before Kyle Benedictus required treatment when he sustained a head-knock out on the far touch-line. As he received treatment, Wright succumbed to his earlier injury and was replaced between the sticks by substitute keeper Robbie Thomson. Montrose tried to take immediate advantage, and Andrew Steeves’ cross found Craig Johnston in space, though his shot was dragged wide of the target. Graham Webster then tried his luck, but the Rovers defence scrambled the ball clear, before finally venturing up the pitch with their first serious foray into the Montrose half. Nathan Flanagan pounced on a defensive error to steer a low cross into the box which was narrowly missed by Kevin Nisbet. Shortly afterwards, Grant Gillespie tried to rouse the south stand with a crisp shot from 20 yards, though his shot curled wide without troubling Jordan Millar in the Montrose goal. Ross Matthews was next try his luck with a speculative effort from outside the box, but again the shot failed to hit the target. Montrose responded immediately, and Johnston appealed for a penalty when he tumbled in the bon when challenging for a high ball. Referee Grant Irvine, however, was unmoved by the admittedly half-hearted claims. With almost half an hour played, Montrose took the lead which their dominance up to that point deserved. A low corner kick to the near post was met by the rushing Webster, whose deft flick evaded Thomson and found the top corner of the net. Shortly afterwards, things got worse for the home side when Gillespie came off second best in a strong challenge, and he was replaced by Chris Duggan, a change which meant Lewis Vaughan dropped back into midfield. Vaughan then tried his luck with a couple of speculative free-kicks from distance, the first a floated effort which was cleared with the minimum of fuss, and the second was blasted into an impressively-resolute wall. As the opening half drew to a conclusion, Montrose looked more likely to extend their lead than Rovers were to restore parity, and right-back Terry Masson should have done better than screw his shot well wide from a promising position inside the Rovers box. As the players made for the tunnel for half-time, the Rovers fans made clear their frustration over what was a poor first 45 minutes for the home side. The Rovers players emerged early for the second half, and indulged in a brief huddle as they awaited their opponents. The message was clear – a vast improvement was required if anything was to be taken from the match, and the players were keen to deliver that. Indeed, Nisbet burst forward straight from kick-off and rifled a shot at goal which certainly signalled Rovers’ intent. The young forward was then thwarted by Millar as he bore down on goal, although for all Rovers’ efforts it was Montrose who came close to increasing their lead when a header by Martin Rennie smacked Thomson’s crossbar with the keeper beaten. Happily for the home side, the rebound was quickly cleared. Lewis Milne then had a shot cleared as he looked poised to score – there was no shortage of Montrose visitors willing to put their bodies in the line in a bid to maintain their advantage. That said, just over ten minutes into the second half, Rovers equalised. Vaughan created an opening in the middle of the pitch, and his slick pass found Nisbet lurking with intent on the left side of the penalty area. He in turn delivered a wicked cross into the area, where Ross Matthews gratefully steered a shot into the net off a defender from six yards out. 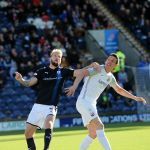 The equaliser, however, failed to galvanise Rovers, and Montrose should have regained the lead when a slip by Davidson presented Masson with a chance, though the defender’s shot was rushed and failed to find the target. Rovers scorer Matthews was then replaced by Liam Buchanan as Rovers went for a more attacking formation, but for all their territorial supremacy, most attacks broke down in or around their opponents’ penalty area without seriously testing Millar. With fifteen minutes remaining, Buchanan arrowed a pass through to Nisbet, but the striker’s form shot found the side-net. Vaughan then evaded several tackles before scooping his shot well over the bar from a promising position on the edge of the box. As the game entered its closing stages, Rovers enjoyed the lion’s share of possession without really looking like grabbing a winner. Montrose were clearly happy to take a point – one substitution took an age to complete – although they almost snatched all three when a rasping shot from Sean Dillon drew a superb save from Thomson. As time ran out, Wedderburn was named man of the match, and almost immediately marked the occasion in style with a shot which whistled over the bar from twenty yards. Montrose substitute Ross Campbell responded in kind with a similar effort which looped into the Rovers fans in the south stand who were shuffling towards the exits. There was just about time left for Paul Watson to leave Vaughan in a crumpled heap in the middle of the pitch with a crude tackle which surprisingly went unpunished before the final whistle sounded. In the end, few present would have denied that a share of the spoils was a fair result. Being the home side, Rovers will be disappointed not to have claimed a win, but a below par performance was at least credited with a point. It remains to be seen whether a new manager will be in situ by the next match, a difficult assignment on the road to promotion favourites Dumbarton. Thankfully Wright survives and is back on his feet. Poor first half from Raith, no shape with players all over the place. Montrose on top. After two trips north in recent weeks, Rovers return to home comforts this Saturday, with Montrose the visitors to Stark’s Park. It’ll be the Gable Endies first visit to Stark’s Park on league duty for 26 years, with the last league meeting between the two sides taking place in March 1992, although the sides have met on cup business on five occasions since. The last occasion was in July 2016, when Chris Johnston and Lewis Vaughan were the scorers in a somewhat fortuitous 2-1 win for the Kirkcaldy side in a League Cup group stage fixture. Stewart Petrie’s side won the League Two title last term, making this their first season outwith the basement division in 22 years, and despite a strong start to this campaign, they currently occupy bottom spot in the table. Wins over Airdrie and Brechin in the first few weeks saw them sitting in the promotion playoff spots, but three consecutive league defeats have sent them sliding back down the table. They go into this one on the back of two fixtures against Dumbarton, and while the first saw Montrose win 1-0 in the Challenge Cup, their league fixture was less successful for the Angus side. Craig Johnston had given Montose the lead just before half time, but two goals in three minutes from Andy Dowie and Ross Forbes, bagged the Sons the three points. You have to go back some time to find the Gable Endies last win in this fixture, with a 3-1 win in May 1985 their last triumph over Rovers. Since then, Rovers have won eight and drawn one of the nine meetings between the sides.